On March 27 2019 we welcomed 40 organisations on to campus to share their placement and graduate vacancies. 951 students joined them for the three hours for a very successful pilot event. A recruitment event to promote ‘live’ or upcoming job vacancies. Any sector, and for large organisations or SMEs. Direct Entry/Graduate level jobs, or Paid Internships and Placements. Sectors covered included: IT, Business & Finance, Marketing, Teaching, Law, Healthcare (Nursing, Occupational Therapy, Physiotherapy), Management, Events, Tourism, Design Engineering and many more. 'I feel very confident that we have met people today that we could employ on Placements or Graduate roles, lots of strong candidates'. More information below, as I am sure we will host something similar in 2020. Jobs should be ‘live’ or open for applications April - July. Paid professional ‘direct entry’ graduate level roles, Graduate or Placement Schemes and Paid Summer Internships. All jobs should be Career related. You can tell us on the Booking Form which activity you prefer, for us to then inform the students. You’ll also be able to tell us the courses you want to meet students from, and we’ll invite them to meet you. Exhibitors encouraged to focus on CV Checks, Portfolio Reviews, or Speed Interviews, etc. so all students leave with advice to help them move forwards, and the organisations can talent spot. 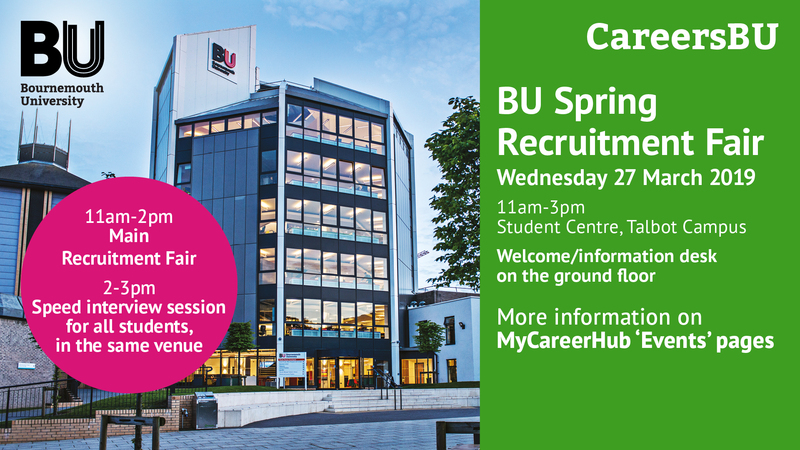 This particular fair is not for part-time roles that are not course related, we have a Part-Time Jobs Fair on October for those opportunities. Don't forget all live jobs can be promoted through this website. We average over 200,000 job views per year, and all c17,000 students (and graduates for three years) have access to the platform. The Homepage explains this in more detail.